? ?SB-Cart by SitBack Vehicles is a self-driving cart (or autonomous mobile robot) for moving materials in a warehouse. Traditional Automated Guided Vehicles (AGVs) require floor magnets or navigation beacons to navigate. However, recent advances in technology have allowed for the development of indoor self-driving vehicles (SDVs) or autonomous mobile robots (AMRs). These robots or vehicles come with various sensors and a powerful on-board computer that enables them to navigate based on the natural infrastructure (such as columns, walls, and racks) of an indoor facility.
? 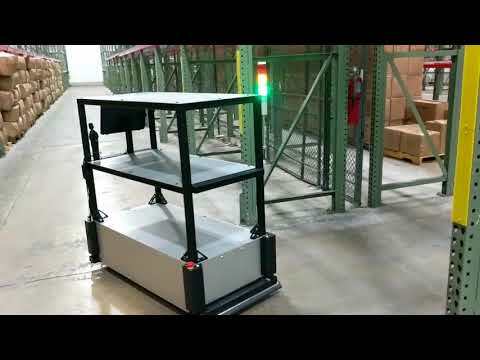 ?SB-Cart by SitBack Vehicles is a self-driving cart for moving materials in a warehouse. Recent advances in technology have allowed for the development of indoor self-driving vehicles (SDVs) . The SB-Cart comes with various sensors and a powerful on-board computer that enables it to navigate based on the natural infrastructure (such as columns, walls, and racks) of an indoor facility. A key advantage of our self-driving technology is that within hours, we can have a facility mapped, driving routes set-up, and the SB-Cart up and running. Additionally it can be configured to hold multiple shelves, carry up to a 1000 lbs and has a long battery life. Automate your material transport with our self-driving cart. Similar to conveyors, self-driving vehicles can increase productivity and reduce the amount of travel time required by workers. ?